EVERYTHING YOU KNOW IS WRONG « THE BRYCE IS RIGHT! 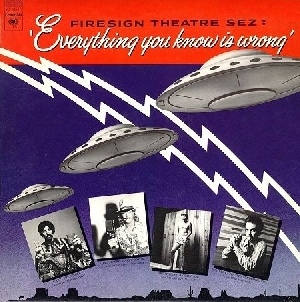 Years ago, the Firesign Theater comedy troupe recorded an album entitled “Everything You Know is Wrong” (Yes, I am a fan and still have the original LP). This particular album was a satire of New Age beliefs whereby they contend everything we have learned is absolutely wrong and we are all being intentionally misled. Large or small, everything we know is wrong; e.g., that the south won the Civil War, that the Aztecs invented the vacation, etc. It’s a very entertaining album which Firesign fans know well. I was brought up to believe if you worked hard, and kept your nose clean, everything would work out for you; that your company would keep your best interests at heart and, in the long run, you’ll do just fine. As we all know, there is no such thing as corporate loyalty anymore and, in this dog-eat-dog world, trouble somehow seems to find us, regardless of how honest and forthright we try to lead our lives. Further, it seems unscrupulous cheating and dishonesty is rewarded as opposed to punished. “Quick and dirty” solutions also seem to be preferred over craftsmanship and quality. Instead of getting to the root of a problem, we only address its symptoms for the sake of brevity. In other words, facade is preferred over substance. I was also taught you should pay your bills on time, and avoid incurring debt which would be difficult to pay back. Now it seems “take the money and run” is the modus operandi of a lot of people, businesses, and government. Between our lenient bankruptcy laws and our inclination to spend, people are taught not to pay their bills. After all, someone else will take care of it for you, right? This also gives me the uneasy feeling that perhaps my money is not my own, even though I worked hard to earn it. As I was growing up I was taught everyone should be treated fairly; to give each person the benefit of a doubt until proven otherwise; that it was also important to be responsible, and your word was your bond. However, it seems morality is not currently in vogue and notions such as honor and principles are politically incorrect. Finally, in grade school I was taught the United States was a great country we should all take pride in, and that government was a servant of the people, not the other way around. Boy, I guess I really got this one wrong. It’s a bit disheartening to realize what you thought was right is wrong, and vice versa. That two plus two no longer equals four anymore. It’s all very confusing. Then again, perhaps it’s not my age that caused this epiphany, but maybe I’m sensing nothing more than changes in our culture. If, in fact, everything I learned is wrong, I sure hope I come down with a bad case of Alzheimer’s Disease soon so I can blot all of this out. It is disturbing to discover the world described in Firesign Theater’s album makes more sense than the real world. This entry was posted on May 28, 2010 at 5:11 am	and is filed under Uncategorized. Tagged: everything you know is wrong, Florida, MBA, palm harbor, tim bryce. You can follow any responses to this entry through the RSS 2.0 feed. You can leave a response, or trackback from your own site.